Mobile and Unwired | OhGizmo! If the above picture vaguely reminds you of something, you’re not crazy. Well, you might be crazy but not about this particular subject. We showed you a mouse/keyboard combo a couple of years ago that looks have evolved into what you see above. 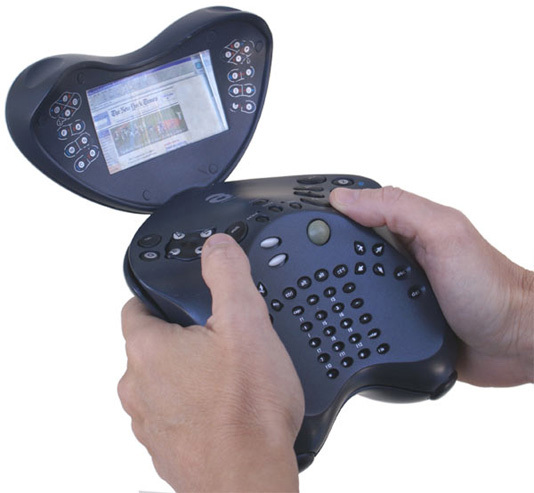 This is actually a small computer that is about the weirdest thing I’ve seen in a while. The idea that you’d be able to have a full keyboard, trackball and even a touchscreen in a small device seems like it would be cool, but looking at the strange shape and tiny screen, I seriously doubt it would ever catch on. Honestly, I would half expect to get beat up if I walked down the street using this. Remember last year when we told you that those crazy Japanese pet feeders that you could control from anywhere? It seemed like just another one of those gadgets that only the Japanese would probably use, and thus would never be available over here. Well, I was wrong, someone has developed a similar feeder just for us here in the US. 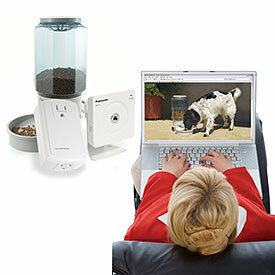 Like the iSeePet360 you’ll have a decent-sized container for dry food, and a webcam for viewing your pet. You can choose to feed your pet on a timer, or do it manually. You can tune into the webcam to watch your pet eat (if that’s your thing) or simply have it automatically email pictures of your pet at each feeding. The best part? It only costs $298, which is almost $150 cheaper than the Japanese product. By Chris Scott Barr on 01/18/08 • Leave a comment! When you travel, how many gadgets would you say that you take with you? For me it just depends on where I’m going, but I always have my laptop, Nintendo DS, camera and phone, all four of which need power at some point or another. When I’m staying at a hotel room, there are usually only two outlets at most that are next to each other, which means that I have to go across the room to plug something in. 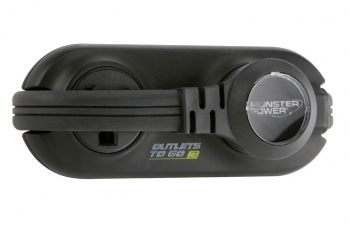 This is why I could use a small power strip to carry around, and Monster has the best one I’ve seen. Just look at it, it’s the perfect size to throw in your bag, and it gives you that one precious outlet that you always seem to need. You can pick one of these up for just $15, not too shabby. By Chris Scott Barr on 01/09/08 • Leave a comment! SD cards are becoming more and more useful every day. I loved them back in the day because I could swap out cards between my camera and PDA (yes, I carried a PDA). Later my phone used a miniSD card, which with an adapter also worked with my (newer) camera. Not too long ago we saw the release of the Eye-Fi, which was an SD card that gave your digital camera a wireless connection which you could use to transfer images. 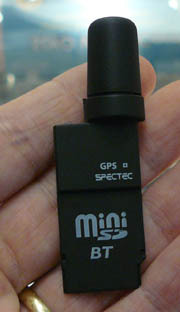 Now we have the miniSD Bluetooth GPS unit. I never really thought that an SD card could pack in a Bluetooth and GPS chip, but Spectec has gone a step further and crammed it all into a miniSD card. This little adapter can plug into your handheld device, which will then use a certain set of drivers to communicate with the GPS. If your device doesn’t happen to have those drivers, you’re still in luck. The card will use its Bluetooth connection to talk to your device and transmit the GPS signal. No word yet on pricing or availability. By Chris Scott Barr on 12/07/07 • Leave a comment! All too often we see companies trying to blend a multitude of functions into one gadget. The end result is generally something rather hideous that can’t do anything very well. So naturally it’s rather refreshing when I come across a device that combines several things into one. This SlimBlade Mouse from Kensington is a perfect example. 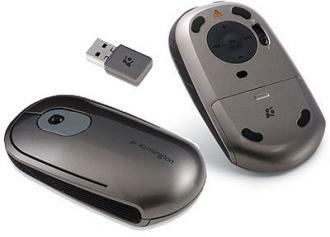 Many people give Powerpoint presentations from their laptop, so it’s only natural to have a mouse that also serves as your presentation remote and laser pointer. It’s even smart enough to power off whenever your laptop goes to sleep. How cool is that? You’ll have to pony up a little extra for this notebook mouse, however the $79 price tag is well worth it.